This website is for ships’ crew of the FBL— more than 40 years on. Furness Withy took over the passenger traffic between New York and Bermuda from the Quebec Steamship Company in 1919. This Company had had a contract with the Bermudian government since 1874 for a three-weekly service from New York to the island, carrying freight, mail and, as time passed, more passengers. In 1920, Furness Withy’s service, known as Furness Bermuda Line, carried some 22,000 passengers to the island. As Bermuda became a major tourist destination for North Americans, attracted in part by the availability of alcohol while Prohibition was still in force, Furness Withy made substantial investments in Bermuda’s holiday facilities, including the Mid Ocean golf club, the St. George, Bermudiana and Castle Harbour hotels, and two tenders to carry passengers from ship to hotel. During the 1920s, Forts Hamilton, Victoria and St George carried the passengers. After Fort Hamilton was sold in 1926, a new larger ship, Bermuda, was launched in 1927. Bermuda caught fire in Hamilton harbour in 1931 and was returned to Belfast in northern Ireland for repair, where she caught fire again. Vickers-Armstrong in England was then contracted to build Queen of Bermuda, which entered service in 1933. After Fort Victoria sank in a collision off New York in 1929, Vickers-Armstrong was contracted again to build Monarch of Bermuda, which ran with Queen of Bermuda from 1933 until 1939. During World War II, Queen of Bermuda served as an armed merchant cruiser and Monarch of Bermuda as an infantry landing ship. In 1940, the Monarch also shipped £40m of British gold reserves across the Atlantic to Canada for safety. After the war, Monarch of Bermuda went to north-east England to be re-fitted for commercial service but was virtually destroyed by fire in 1947. The British government bought the ship, which became New Australia and then Arkadia until broken up in 1966. Furness Withy & Company Limited was established in north-east England in 1891 with just 18 vessels. For nearly a century, the company developed its transatlantic trade and, through partnerships, purchases and acquisitions, expanded its fleet and services to Australia, South America and the Mediterranean. Furness Withy was purchased by the Tung Group of Hong Kong in 1980 and re-sold to the Oetker Group in 1990. Today, Furness Withy Chartering specialises in bulk carrier ship and cargo operating. The Bermudiana Hotel is seen top right from the Queen of Bermuda in Hamilton harbour, Bermuda. Photo: Allan Davidson. 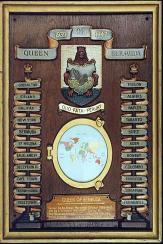 Queen of Bermuda battle honours— proudly displayed on A deck square.